It's a slower start to the day for me - we've been looking after Buster, our God-Dog, while my sissy had a holiday. He went home yesterday and so this morning I'm sort of revelling in the fact that I could stay in my unshowered state till lunchtime if I wanted to! I don't, because I've got plans, but it's strange not to factor in a walk before it gets too hot! This side of the house is in it's own shadow until lunchtime, so quite cool to work in. 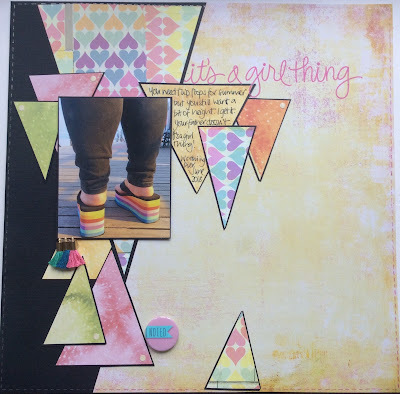 You see the detritus of another scrapbook page, day 26 of the challenge yesterday and when I'd done it, as I so often do, I walked away without clearing up! The heart cookie cutter is one of three that I use as a template to dot gems or liquid pearls around. There's a photo of Mr Dunnit and I on a plane...last summer. It's horrible quality; all bad light and grainy, but I do like it! It will find itself on a layout eventually! Despite having a building site outside the door, I still have a bit of garden to look after, which accounts for the hose end in the basket at top right...new hose, waaay too many end choices! I mentioned a couple of weeks ago that I'd had this idea to see how many cards I could get from one sheet of 12x12 scrapbook paper. Well, as usual, it wasn't my idea, merely something that had entered my brain and resonated in my creative cortex. (Sounds convincing doesn't it!) One quick search on Pinterest will lead you to eleventy million suggestions, and some of them get many many cards from their piece of paper and show you a cutting pattern. Well, of course, I got bored. Having to be exact and follow a pattern isn't in me, especially when some of the shapes don't suit my cardmaking. (The long triangle to fill a corner of a card particularly gives me a mental blank! So I made a few, and still have some paper left, but probably won't finish the exercise. At the workshop, I threw these on the table as ideas. Workshopeers picked their choice of paper from the vast selection that Shopkeeper Gal stocks and they went to work! It was great. The average was eight cards and some of the ideas were absolutely lovely. I can't show you those lovely ideas because I didn't photo them. And besides, they may turn up on this very blog as a straightforward lift with some lame excuse about not crediting the designer because I can't remember. Although the remembering part would be true! A good friend made me join a Facebook group called Inspired by Memories. It's for scrapbookers and memory keepers. It's ideal for me because it's not as fast moving as some of the really big groups, and I find that very helpful! I was lulled into a false sense of security about my desk-time earlier this month and decided to 'sign up' to a 30 day Challenge. A sketch every day in June. The theme, in my mind, is 'try to keep up'. I'm not doing too badly, but of course I'm not up to date It took a crop last weekend to make this pile look erm, pile-ish. I can't bring myself to put them in the album yet, I like to see how I'm doing. If I'm productive. Or smug. Or both in all probability. I really enjoy scrapbooking fairly ordinary and very current things. It means that I have to do a deal with myself. For every up-to-date photo I scrap, I try to do an old one too. But they have to speak to me before they get onto a LO. So for example...…. Miss Dunnit's summer footwear made it onto a page, three days after I took the photo. (all of these are sketch interpretations for the challenge). 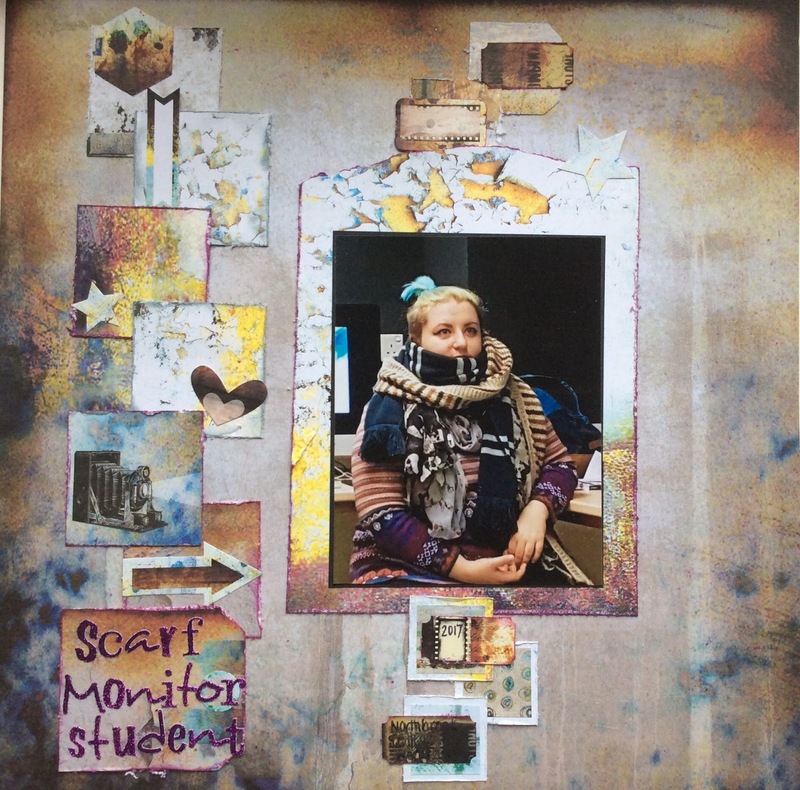 So then I had to do this LO, featuring her being scarf monitor in the workshop at Uni, last year. Quite recent really. Earlier in the challenge, this photo finally spoke to me. It's definitely 10 years old, possibly 12. I can flick through the same pile of pictures for a year, and eventually I can think of something to do with one or two, a title, or a sketch will appear that just suits a pic that's been hanging around for ages. I can get a little fixated in my 'one job at a time'-ness and so I am happy to report that this challenge is still fun, despite my being behind. I'm not pressuring myself so much as spending time at my desk that I otherwise probably wouldn't. A positive of it is that when you do manage to climb onto the 'every day' wagon, it's quite intoxicating. For a procrastinator I feel as if I am the wheel on a roll! It seems that between checking the number and typing the next number, I forgot it, and last week was in fact 471. I have double checked and apparently, double remembered this week. Good grief. My desk, untouched by human hand since Monday. That will change this morning, but only to tidy it. Which will as you can tell, be a monumental relief to all. I've perched my first coffee in about the only empty space. Which suggests that space had a drink in it whilst I was putting this LO together. whilst avoiding football on the TV- watching England play makes me twitchy! The pile at left begins with my patterned scraps in a blue plastic envelope file. Then my alphabet stickers that are in several expandable file pockets, within a large file. Wedged under that, the Moon Sparkles pens - I used the yellow to colour the old Basic Grey alphabet which although in the yellow pocket, were very pale. As usual, I'm out most of the day, but unusually, will be home in time to actually make a few comments this evening, so I look forward to that. I think I've got Instagram sussed, so we'll see how we go! It's a bit dull this early. My desk isn't exactly over exciting either! I've finished this LO but can't quite decide on it being finished. So I'm walking around it for a little while. More old pictures being scrapped here - 1996 I think! I'll need the desk for workshop preps later, so it hasn't got long! At far right you can see the little tool bag that houses my Scan&Cut tools. Yesterday I went to another training session and decided in my wisdom not to take the bag (or indeed, it's contents. Or indeed, the electrical cable. Huh?). Weird really, what you decide when you're in a bit of a hurry! Of course I needed them all! Anyway, all's well that ends well and I think I've learned a couple more valuable methods. We'll see how long they last in my memory! Meanwhile, in the real world, my lovely friend Kathy took part in WOYWW via Instagram last week. This is thrilling. So, I decided to join Instagram. I waited till we visited the-child-who-knows-everything and I asked about it. I was a bit amazed to discover that #WOYWW is already a thing and quite a few non-bloggers do it! More amazing, it sounded pretty easy. Well it's not, because my iPad/Facebook/PC and me don't understand each other. But I am going to sort it out. Just as soon as I get more than one hour at home. Which won't be today. Or tomorrow. So please, be patient. Whichever way you join WOYWW, please join in today, it's very important that I'm not alone and uninspired! I have received more Anniversary ATCs over the past couple of weeks and don't want to miss the chance to share them with you. Because I'm about to find a home for them you see, and as you know, that means the effort of removing them from where ever they find a home, photographing them, putting them back - well, it all becomes a challenge for me doesn't it! Seriously, these little artworks are such a pleasure to receive examine and wonder at! Even Mr Dunnit has wondered at the scale of them. And noticed that this year we've used fairies more than any other single theme. He immediately hit on the master board idea when I invited him to look through my new collection. Interesting isn't it. Not as interesting as his reaction when I said that yes, a lot of us are familiar and use the master board technique. But a lot of us don't. It's all about choice and happiness in making. He was a bit aghast about this part...because it would be 'fiddly' wouldn't it. Then I tried to explain that whichever way they're made, they are loaded with the investment of the time and design and thoughtfulness and that's what is received. Noises were made about 'feelings' and I had to find another way to explain that there was more to it than the ATC itself. I settled on 'an investment in the expression of the solidarity and friendship of WOYWW'. There were murmurings about small round objects. I know. Sometimes even I don't understand myself! I don't know why, but Wednesday feels a day earlier than normal this week; perhaps because I can feel deadlines starting to slip already! A bit chilly and dull this morning. I am still basking in after-party warmth and have received some more lovely ATCs. I will sow them separately so you aren't distracted. I'm also still playing with the 'cards from one sheet' thing, slow because of other jobs rather than lack of ideas - isn't that always the way...idea overload when you can't get near the desk! Apart from putting my half finished coffee on the desk, it's pretty much as I left it last night. A sentiment waiting to be cut out and mounted. My little blue Bluetooth speaker which I should have recharged overnight. The blue wallet file holds patterned scraps. It's not an attractive way of storing them but it means I can lift them all out of the box at once and that means I go through them much more often. I'm in a rush to clear this lot up so that I can attempt a daily sketch challenge on a Facebook group called Inspired by Memories. I can't keep up with daily, but starting a new scrapbook page every few days makes me feel as if I'm making progress. I did one yesterday with a photo from 1996. Progress indeed!! Only minutes after getting home from Spain, we went to Cornwall. It felt like minutes but really it was a week. We had a weekend aboard Amelie Poulain, a converted barge. It sits on the River Fal, a stones throw from the Falmouth estuary at a permanent erm.....berth... mooring? Fortunately, you don't need nautical knowledge. Luckily, in the case of certain landlubbers! I didn't take any pictures of it as a whole, there are some on the Facebook page - search Floathouse. It's big...got 3 double bedrooms and a proper bathroom. By 'proper' I mean big - enough room to shower or bath and step out of either and dance yourself dry. Not posed...brunch on deck. Would like to be there now, I must say! These barges were of course, for carrying goods, and they had little 'sheds' on the decks for the bargees to live in and steer from. Actually, that might be navigate from. I don't know. You don't need to know, this is a permanent dock! So the 'shed' has been removed and more glamorous 'top' has been built as you can see. Such a delicious design to allow for the view, it's hard to tell where the glass stops and the view begins! When the tide goes out, there are birds feeding from the revealed sand, cormorants and seagulls crabbing, a host of swans and erm, lots of others! On Saturday night, we simply at without any lights and let the lights on the river entertain us; just as we thought to turn in, we were treated to a huge fireworks display somewhere over the estuary! We had armchair ringside seats. A lovely bonus! Amelie has a kitchen of course, a proper one with a big fridge and a dishwasher. Or...you can jump onto the quay and visit the popular and busy café on the wharf. Couldn't be more convenient! The wharf also boasts some lovely artisan studios. Jewellery, art, clothes..you know! See my little sunspot in the open front door? My word it was gorgeous. Hot. The wall in front of my chair is the quay side. When the tide is in, the floor is level with the top of the quay. At other times, you make like the French Lieutenant's woman and climb the stone steps from erm, ship to shore. It's not hard or dodgy, but for a land lubber, it's sort of romantic! Of course, you water-life-familiar types will probably cheerfully jump in and out of the dinghy and row yourselves across river or down to the shops. We loved the idea and no doubt that Mr D would have enjoyed it. But then we considered my wonky-fat-woman status and thought better of it! There's no dignity to be had trying to get in and out of a rowing boat I can tell you! Perhaps next time, I'll still be wonky, but I may not need to roll! We did enjoy a leisurely break, I must say. We walked and explored locally and then summoned up the strength to get in the car and go further afield. I've never quite got over that about Cornwall - nothing is very far away! Cornwall in late spring is a gift of wildflowers and promise. We really were lucky with gorgeous weather all weekend. My cousins built and own Amelie, are letting her; if you are on Facebook, you can find their page and contact details by searching Floathouse . You'll know you've got the right page if it says Jubilee Wharf as the address and some of the pics will look familiar! Mr Dunnit says you can tell you've had a good weekend when you're photographing the stones that are acting as door stops! !